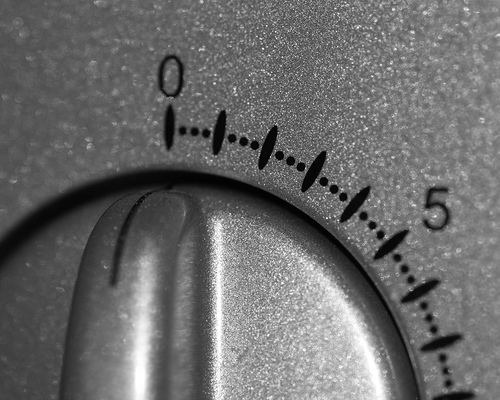 Two Deadlines are Coming Fast! 1) The Big Giveaway is over at 6pm EST on Wednesday, November 21, 2012. Don’t miss your chance to win a copy of The Poorhouses of Massachusetts by Heli Meltsner. It’s so easy to win. Here are the instructions. 2) Don’t Miss your chance to get a FREE Heirloom Registry tag from our sponsor, Houstory. The registry id tag will let you try out the Heirloom Registry and preserve the story behind one of your heirlooms. What better opportunity than to try something for free to see if you like it. The giveaway end Thanksgiving Day. Details are here. 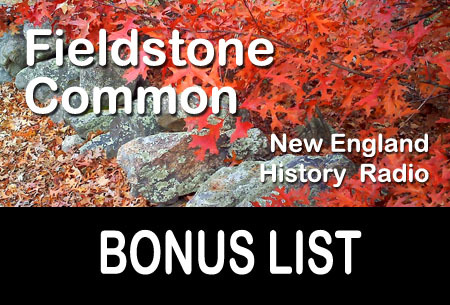 During the November 15, 2012 episode featuring the Poorhouses of Massachusetts, our sponsor Houstory made a very special offer to the Fieldstone Common audience. 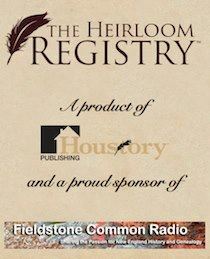 They are offering one FREE permanent Heirloom Registry to every Fieldstone Common listener. Not familiar with the Heirloom Registry? Read about my personal experience using it. To receive your free Thanksgiving Gift from Houstory, follow this link and add the registration number to your cart. At checkout, simply type in “TURKEYDAYGIFT” in the coupon code box. Your permanent registration code will be emailed to you. Fieldstone listeners can also take 15 percent off the purchase of your entire order, including registry stickers and brass plates — which make attaching a registration number to your heirlooms even easier — by using the coupon code “FIELDSTONE.” This offers end on Thanksgiving day.